While Americans may be used to the idea of city specific slogans (e.g. I went to high school in Placentia, “A Pleasant Place to Live”), and state nicknames (I hail from California, “the Golden State”), Koreans take it a step further with city mascots/characters. There is no shortage of cute things in Korea! 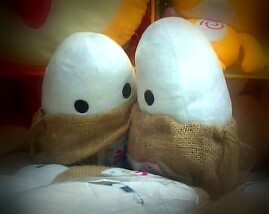 I spied these darling little rice grains (complete with their brown husks) as prizes at a game arcade. Aren’t they adorable?